Modern-day Toronto: A heavy leather-bound book written in an unrecognisable language is delivered to the Speckled Muse, the antique bookshop owned by Crystal and Becca Hatcher’s mother. 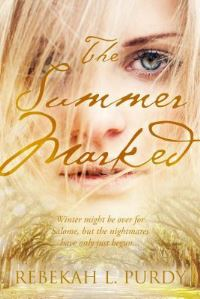 When Becca opens it, she’s sent into a coma, leaving Crys behind to uncover a series of terrifying secrets. Ancient Mytica: A merciless goddess hunts for the elusive treasure that will make her ruler not only of Mytica, but of all the unseen worlds that lay beyond it. Modern-day Toronto: Rich and aimless Farrell Grayson finally has the chance to prove himself when the mysterious leader of a powerful secret society invites him into his fold. Ancient Mytica: Maddox Corso has always been different, but never remarkable. Everything changes the day he meets a pretty, unfamiliar girl from a faraway land, only to realise that he’s the only one who can see her. Modern-day sisters discover deadly magic from Ancient Mytica in the first installment of Morgan Rhodes’s Falling Kingdoms spin-off series. 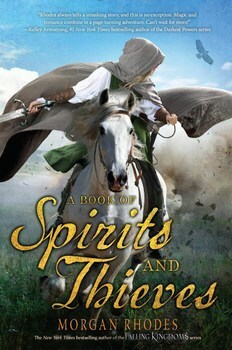 New York Times bestselling author Morgan Rhodes takes readers into exhilarating new high-fantasy territory with A BOOK OF SPIRITS AND THIEVES. Written in alternating perspectives that shift between modern-day Toronto and the ancient kingdoms of Mytica, Rhodes masterfully weaves the dark, magical world of her Falling Kingdoms series into an epic contemporary saga that will leave you breathless.